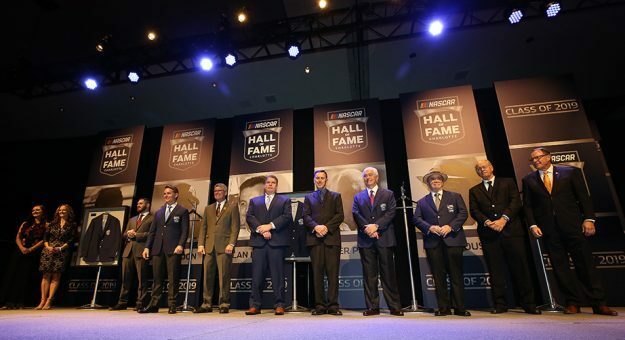 Three drivers and two owners were recognized for their enormous contributions to NASCAR racing with induction into the NASCAR Hall of Fame. Four-time NASCAR Cup Series champion Jeff Gordon headlined a 2019 class that included drivers Alan Kulwicki, the last privateer to win a Cup championship, and Davey Allison. After an introduction from fellow California Cup driver Kyle Larson, team owner Rick Hendrick, along with Gordon’s son Leo and daughter Ella, presented the final induction honors of the night for the newly inducted Hall of Famer, who won 93 Cup races, third most all-time. Gordon then proceeded to thank those who played key parts in his storied career, from Hendrick to three-time champion crew chief Ray Evernham to stepfather John Bickford to his wife Ingrid and his children. “Raising a family is similar to racing – some days you’re hanging in the back, hanging on tight, holding on and hoping a caution falls at any second,” Gordon said. “Other days you’re pulling into Victory Lane celebrating and proud as you can be. The winner of 19 Cup races, Allison was leading the championship standings by 30 points over Kulwicki entering the final race of the 1992 season but contact from Ernie Irvan early in the race ended his title hopes. Davey’s son, Robbie Allison performed the induction honors, assisted by Davey’s wife, Liz Allison, and daughter, Krista Allison-Sheinfeld. Penske numbers Cup championships in 2012 (with Brad Keselowski) and 2018 (with Joey Logano) among his myriad accomplishments in motorsports. In addition to his record 17 Indianapolis 500 victories– the most recent with driver Will Power last year — Penske has amassed 111 victories at NASCAR’s highest level and another 68 wins in the Xfinity Series to go with four owner’s championships. “I guess tonight I won’t be Mr. Fun—I’ll be the Captain,” Penske quipped in his acceptance speech, referring to his other, more well-known moniker. At the NASCAR Hall of Fame dinner that preceded the induction ceremonies, long-time NASCAR writer, broadcaster and author Steve Waid was recognized with the Squier-Hall Award for NASCAR Media Excellence.